69 LITERATURE GALLERY Call 1.800.789.6633 or visit ProtectiveProducts.com ECONO RUNNER Water-resistant padded protection stays in place on just about any surface. The best value in reusable protection. Water-resistant padded protection stays in place on just about any surface. The best value in reusable protection. Nationwide Protective Coating Mfrs., Inc. 1.800.423.7265 www.nationwidecoatings.com DECK GUARDIAN ™ is an elastomeric waterproofng acrylic, high build, wood and concrete deck-over coating. Forms a fexible, yet tough and durable, aesthetically pleasing new deck surface, and can be tinted to most any color. DECK GUARDIAN ™ is ideal for water- proofng and restoration of damaged decks and patios instead of total replacement. Drywall Art Remodeling Ideas visit www.trim-tex.com PROTECTION your remodel for Prevent inside corner drywall cracks with Magic Corner Maintenance-Free Aluminum Cupolas & Louvers! Stock & custom Cupolas from New Concept Louvers are wrapped with coated Aluminum or Copper. Made from the same materials as our custom Louvers, they never require painting like wood products. They arrive in three easy to install pieces pre-cut to fit any roof pitch, and can be ordered in stock sizes or to custom specifications. Over 400 colors are available, as well as many different Weather Vanes and accessories. www.NewConceptLouvers.com 800 635-6448 ® 1-800-446-7659 dsicolumns.com BEAUTIFUL • DURABLE • STRUCTURAL 12 STANDARD AAMA 2604/PCI A2 ARCHITECTURAL GRADE COLORS ROUND FLUTED SQUARE FLUTED SMOOTH WITH ASTRAGAL RECESSED SMOOTH For more info circle 56 For more info circle 59 For more info circle 55 For more info circle 60 For more info circle 57 For more info circle 58 For more info circle 61 WELCOME to our Literature Gallery, a special showcase featuring new and innovative building products. For more information, circle the number of the item on the Reader Service Card. 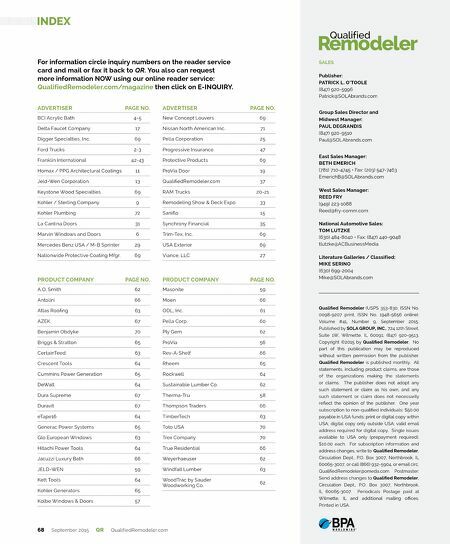 You can also request more information NOW using our online reader service: QualifedRemodeler.com/magazine then click on the E-INQUIRY button. 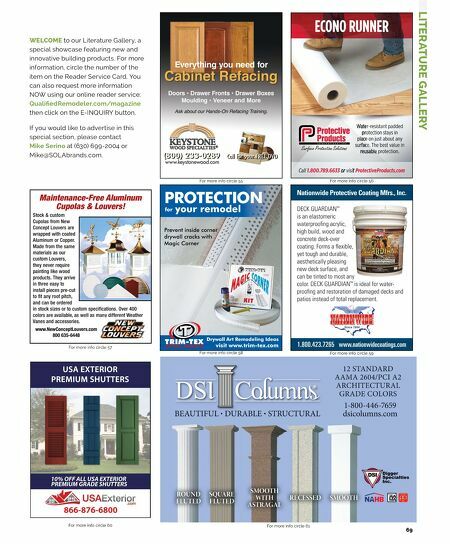 If you would like to advertise in this special section, please contact Mike Serino at (630) 699-2004 or Mike@SOLAbrands.com.